SKYSCAN 1072 microCT is designed to produce accurate volumetric analysis and 3-D imaging of radio-contrasting materials; e.g. bone, biomaterials, protheses. It has also applications in industrial research and development. Ex vivo microCT is capable to voxel (“3D pixel”) resolution at µm scale. Sample size is limited to approximately 2 cm in height and thickness. The greatest resolution can only be achieved from small samples. The accompanying analysis software is capable to produce data describing various aspects of the sample structure and radio-absorbance, which in case of bone corresponds to mineral density. Also soft tissues can be analyzed to some extend and radio-contrasting materials can be used to visualize vasculature. When planning experiments where SKYSCAN is applied it should be notified that e.g. 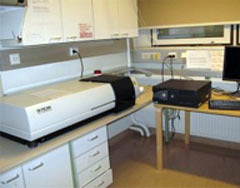 sample scanning lasts from 30 min to 4 hr depending of sample and desired image quality. Reconstruction of primary images to tomography sections lasts approximately 45 min/sample. Analysis of reconstructed images can be done on a separate computer.